Win Tickets to bbcon 2016! Our Development Manager Eileigh shared her story about being out of her comfort zone. NTEN: The Nonprofit Technology Network is excited to give away 10 tickets to bbcon 2016. We’re looking for your best story about a nonprofit tech fail. 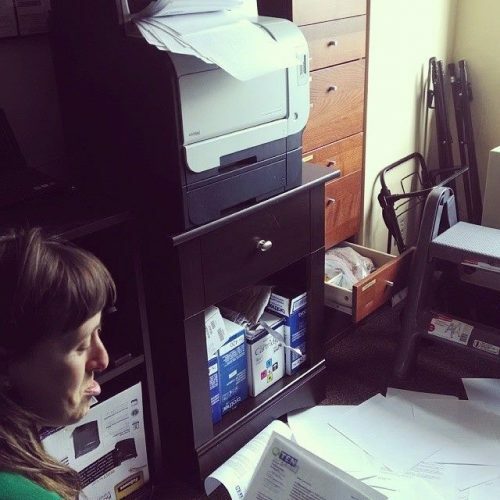 Like poor Eileigh, our Development Manager, pictured here in the midst of a mail merge gone horribly awry, which was then worsened by a possessed printer. Fill out the form below by 5pm PST Friday, October 14 for your chance to win a ticket. We’ll choose our favorite 10 stories from the submissions and notify the winners via email on Friday, October 14. Entries may be used in our promotions.